Full depth tread grooves help keep a steady grip in the wet even as the tire wears. Higher groove-to-tread ratio means the tire grooves are more open to disperse water and to provide more biting edges for snowy conditions. Two steel belts protect the casing from punctures to enhance the life of the tire. Circumferential grooves, lateral grooves, and sipes effectively evacuates water out from unded the contact patch to provide reliable wet traction. Wide shoulder blocks and advanced profile design improve steering response and handling. Precision-engineered profile ensures even wear and long mileage. 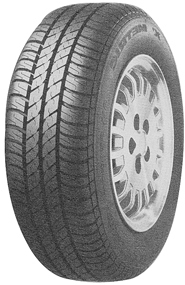 Special rubber compound remains pliant even in the cold to provide superb all-season traction.